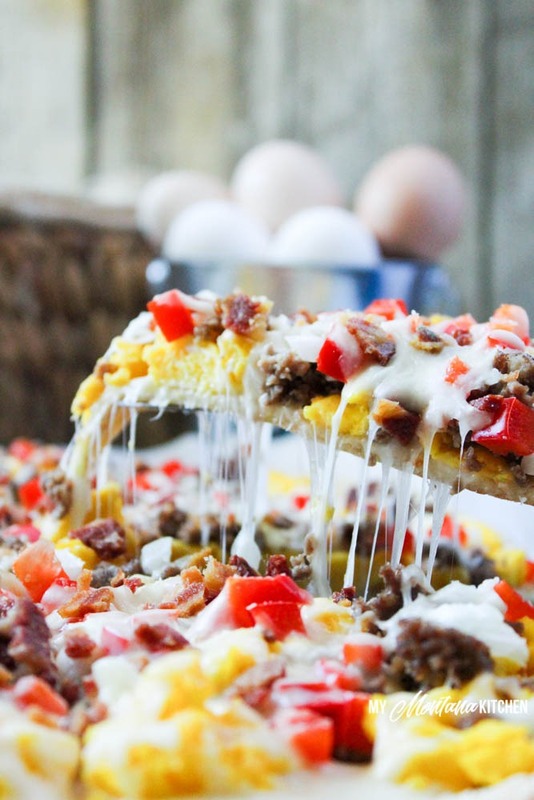 A low-carb pizza crust topped with all your favorite savory breakfast toppings. This recipe is low carb, gluten free, and a Trim Healthy Mama S Recipe. This pizza was so good – I served it to my family for brunch last week and we all enjoyed it. The nice thing about this recipe is that it is completely customizable to your personal preference. If you do not like onions, leave them off. If you love mushrooms or spinach, add it. You can really pile on the vegetables here! I added sausage (we make our own) and bacon (because bacon makes everything better, right?). Red peppers and onions are the vegetables I had on hand, but I would love to add more vegetables next time. You could also switch up the cheese you use. I think Pepper Jack would be lovely! 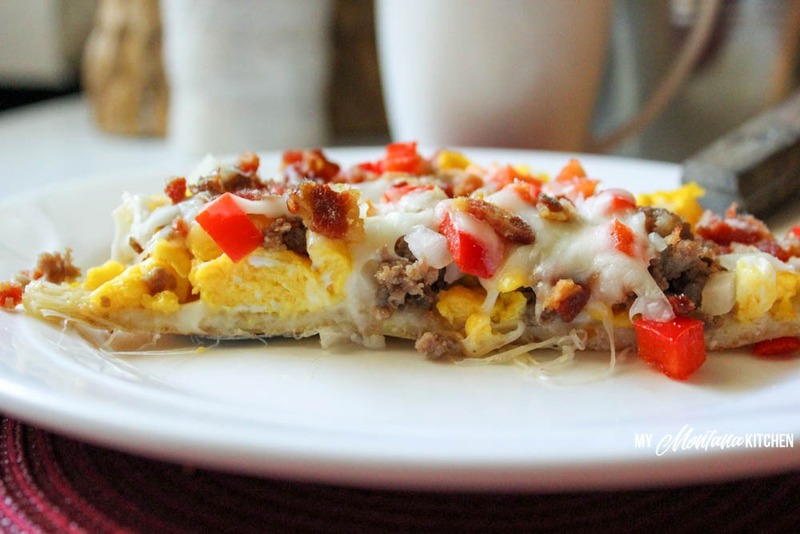 So, what do you need for this low-carb breakfast pizza? 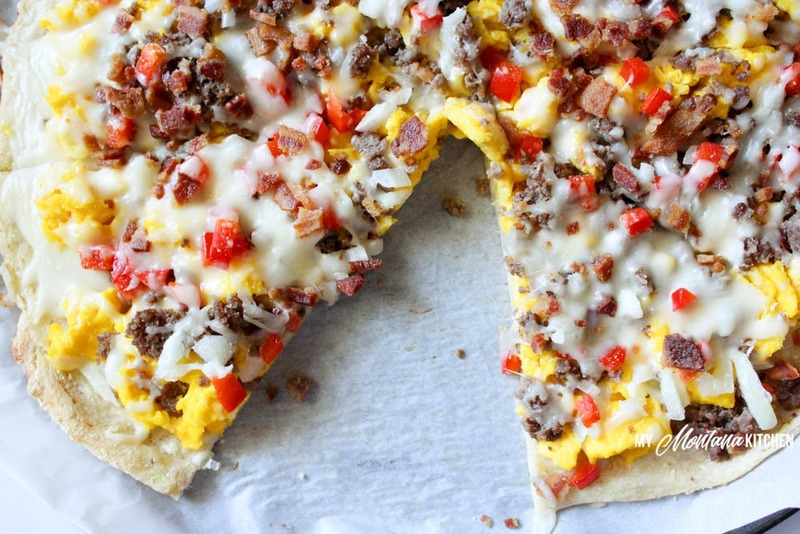 This recipe makes 8 large slices of breakfast pizza. If you need more breakfast ideas, please be sure to check out my Easy Breakfast Ideas. Between two pieces of parchment paper, roll dough into a large circle. Remove from oven and sprinkle crust with 1/2 cup cheese. Add remaining toppings and remaining cheese. If you do not have the baking blend called for in the Stromboli Dough, feel free to use almond flour. It works just as well, though the macros will not be the same as listed here. Nutrition Information Per Slice: Calories - 404: Fat - 30; Carbs - 7; Fiber - 3; Net Carbs - 4; Protein - 28. 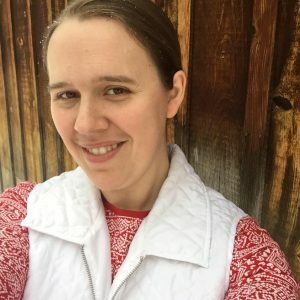 Just wanted to let you know that I’ve saved several of your recipes to try, and high on my list is the Stromboli recipe. That looks amazing! I’m excited about this breakfast pizza recipe, too. I’m thinking it may be something I could make ahead on weekends and then just heat up on weekday mornings. Thanks for taking the time to develop these recipes, photograph them, and write them up to share. I appreciate it! Awesome! I’m so glad you found something to enjoy! Let me know what you think of the Stromboli! This looks good! Does it reheat well? If so, do you have any reheating tips? Yes, it reheats well. I think we just reheated it in the microwave for 30 seconds or so. But I’m sure you could also reheat it in the oven.